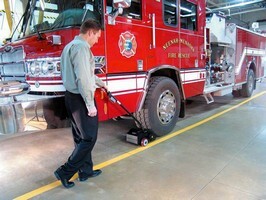 Portable Roller safely moves large chassis/heavy vehicles. Roll Mover(TM) allows single operator to safely move heavy rollable loads without tangled air hoses snaking across shop floor during or after manufacturing. Portable, tether-free, and battery-powered unit features toggle handle with variable-speed throttle that facilitates operating efficiency, rugged gearbox turns industrial-grade drive rollers that can push/maneuver any large product on wheels, and rugged construction facilitates extended use in demanding work environments. Portable mover allows a single worker to easily and safely move a large, heavy chassis during or after manufacturing. (Neenah, Wis.) - The new Roll Mover(TM) from Appleton Manufacturing Division is ideal for safely moving large chassis or heavy vehicles during and after manufacturing. Portable and tether-free, the battery-powered RollMover allows a single operator to easily move the heaviest rollable loads without tangled air hoses snaking across the shop floor, a common problem when using pneumatic movers. Workers can increase productivity while freeing up tow motors and forklift operators for more demanding tasks. The convenience of a battery-powered mover helps decrease worker injuries that can result when attempting to push heavy loads by hand. A toggle handle with variable-speed throttle facilitates operating efficiency. A rugged gearbox turns industrial-grade drive rollers that can push and maneuver any large product on wheels. An easy-change, quick-charge battery, combined with overall rugged construction, provides for extended use in demanding work environments.